Indiana is hit hard by the opioid epidemic. Medical experts say medicine is the most effective treatment. Why aren’t we using it? Words by Megan Jula. Development by James Benedict. Video by Lexia Banks. Photos by Katelyn Rowe and Yulin Yu. 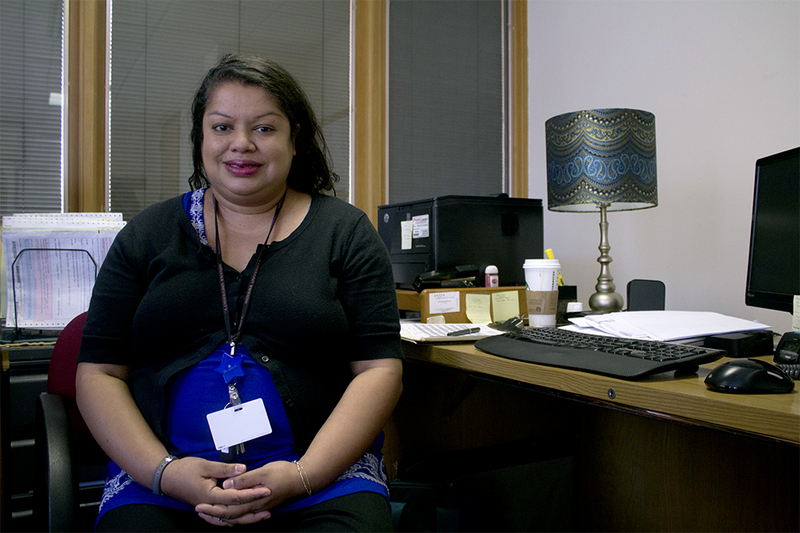 Dr. Nishanie Gunawardane — “call me Dr. G” — prescribes drugs to drug addicts. Gunawardane is a psychiatrist who specializes in addiction. She was hired last August at Bloomington’s branch of Centerstone, a series of community-based healthcare providers treating mental illness and substance abuse. There, Gunawardane works with recovering addicts who are overcome by opioids like heroin and oxycodone and prescribes them other drugs to help them through their addictions. It’s called medication-assisted treatment, or MAT. Recovering addicts take drugs such as Suboxone, methadone and Vivitrol as a long-term means to treat their addiction. Tom, one of Gunawardane’s patients, came to Centerstone begging to be put on Suboxone. Because of his illegal drug use, the Indiana Daily Student will not include Tom’s last name. Before, he would pop pain pills or snort heroin just to get out of bed. About 2 million Americans were addicted to opioids in 2014, according to the Substance Abuse and Mental Health Services Association. In Indiana, opioid-related deaths have soared — quadrupling in the last decade. According to the State Department of Health, 105 people died in 2004 and 420 died in 2014. An opioid addiction epidemic that started in the North East in the 1990s has moved to Indiana over the last decade. Many people started with legitimately prescribed opioid pain relievers but switched to buying the drug illegally or to heroin. Defining addiction treatment is complicated. Methadone and the newer Suboxone are opioids. They work by using the same nerve cell opioid receptors that heroin or pain pills activate but don’t cause as strong an effect. Vivitrol works differently — instead of activating the receptor, it occupies and prevents any opioid effect. All three medications help prevent cravings, withdrawal and relapse. They aren’t miracle medications that will work for everyone, Gunawardane is quick to say. They come with pros and cons. MAT drugs are widely recommended by doctors and researchers as part of the standard of care for opioid addicts. Dr. Gunawardane, a psychiatrist with a specialization in addiction, works to help people with opiod addictions through medication assisted treatments. The American Society of Addiction Medicine and the American Medical Association have supported this combination of medicine and counseling for over a decade. “Most people who are detoxing or enter into treatment without medicines tend to drop out and relapse and not improve,” said Dr. Marc Fishman, an addiction psychiatrist from Johns Hopkins University School of Medicine. He‘s just as frustrated as Gunawardane that MAT, which he calls a valuable tool, is underused when addicts are dying from their addictions. Prescription pain pills took the American pharmaceutical world by storm in the 1990s. Encouraged by drug companies claiming painkillers such as Vicodin and OxyContin were non-addictive and told they were undertreating pain, doctors wrote prescription after prescription. “How much does it hurt on a scale of 1 to 10?” they began to ask. Doctors could dispense the painkillers with little oversight, easily giving out high doses of the addictive pills. Bloomington is loaded with drugs, Tom said. He remembers first smoking pot as a 12-year-old. He added alcohol and cigarettes in high school and then moved on to pain pills. “The drugs got stronger, and you need more of them,” he said. He would spend $200 a day to get his pain pill fix. In 2012, physicians wrote 259 million opioid prescriptions, enough to give every American adult their own bottle of pills, according to ASAM. A government crackdown on pill mills pushed more users to heroin, said Caleb Branam, supervisor of Centerstone’s Adult Recovery Program. Caleb Branam supervisor of Centerstone's Adult Recovery Program. Four in five new heroin users started out misusing prescription painkillers according to ASAM. Heroin overdoses increased nationwide an average of 37 percent a year from 2010 to 2013. In February, President Barack Obama called for Congress to approve more than $1 billion in funds to fight opioid abuse. The Obama administration wants $460 million to fund medication-assisted treatment, like Gunawardane prescribes. Before he found treatment, he put his family through hell, Tom said. Drug treatment facilities tend to offer one option: abstinence. This means they do not allow any medicines that contain an opiate ingredient. Medication has traditionally not been part of the formula at these types of recovery centers. They aren’t required to have anyone with a medical background on staff and don’t have a huge reason to be reading studies on advances in medicine, said Basia Andraka-Christou, a law Ph.D. student writing her thesis on MAT. Mark DeLong is executive director of Amethyst House, a United Way agency in Bloomington that provides inpatient and outpatient services for drug, alcohol and gambling addictions. 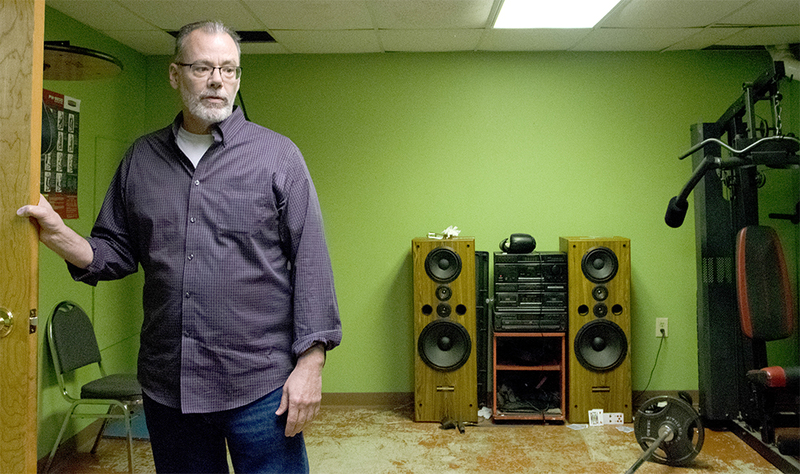 Mark DeLong, the executive director of Amethyst House, shows the workout room in the male inpatient house. Amethyst House is an agency that provides services for people with addiction using a "abstinance only" model. If someone wants to enter the program while taking Suboxone or methadone? People get high on those drugs, he said. Amethyst House uses the 12-step program, Narcotics Anonymous (NA), which is analogous to the Alcohol Anonymous (AA) program. NA includes regular group meetings and emphasizes peer support. The ability of a 12-step program alone to keep patients sober is difficult to gauge. 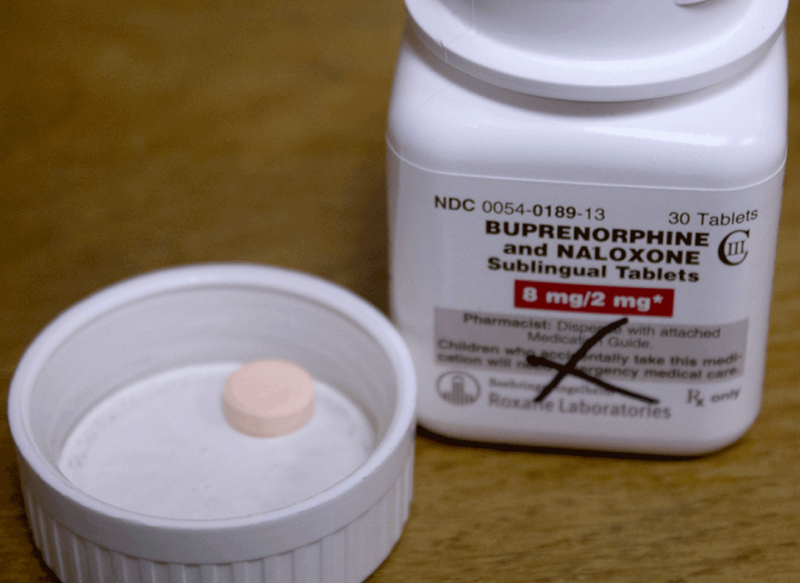 Dr. Herbert Kleber, director of the Division on Substance Abuse at Columbia University and the New York State Psychiatric Institute, said the program may be as low as 10 percent effective. “Of the 100 people who start AA January 1, by December 31 only about 9 or 10 are attending,” Kleber said. The National Institute on Drug Abuse has said even fewer studies exist on the effectiveness of NA than AA. MAT can complement 12-step programs, Gunawardane said. The standard of care emphasizes medicine should be accompanied by counseling and behavioral therapy. “I would like patients who are new to recovery, who are still struggling, to be going to some sort of addiction groups,” Gunawardane said, and named NA, AA or Heroin Anonymous, in addition to Centerstone’s programs, as example. When addicts leave abstinence-based treatment, they have lost their built-up tolerance to opioids. In other words, it would take a smaller amount of heroin or pain pills for them to overdose. Each drug has its own ups and downs, here's a simplified chart to help keep them straight. * Costs are determined from Medicaid's average drug cost per unit. The range of cost reflects different dose's price. Until they hired Gunawardane last year, Centerstone only had a loose policy on MAT. In deciding how to incorporate medicine into their treatment program — which also involves the support of a recovery coach, group meetings and counseling — Branam said they tried not to reinvent the wheel. Dr. G addresses the double standard of prior authorization for MAT drugs. Instead, they looked at what the Substance Abuse and Mental Health Services Administration had to say. The answer: coupling medicine with counseling. DeLong said Amethyst House would accept patients on Vivitrol, but not methadone and Suboxone. These two are forms of opiates, the type of drug addicts are addicted to, and that’s the difference, DeLong said. Most people with opioid addiction do need some sort of MAT, Gunawardane said. But the drugs themselves aren’t a one-size-fits-all miracle medicine either. A lot of Gunawardane’s patients want them, but not everyone is ready for them, she said. Some, like Tom, even abused methadone and Suboxone on the street when they couldn’t find their drug of choice. For example, because Suboxone has a street value, it’s not ideal for a patient without a stable living situation. Kleber was among the first doctors in the nation to prescribe Suboxone. Some people use it to detox, whereas others will sell it, or use it to get high, he said. For other heavily addicted patients, Suboxone wouldn’t be strong enough. Gunawardane tries to get them on methadone. One big issue: the nearest methadone clinic is in Indianapolis, and the drug needs to be taken daily. Because of its potential abuse, clinics aren’t allowed to give new patients multiple doses to take home. Her patients often don’t have a driving license or means to make the trip. And they have to be on time. Driving there from Bloomington, “individuals would have to get up at 3, 4, 5 o’clock to be dosed,” Branam said. Both Suboxone and Methadone require a special license to distribute. The limited locations and times of these drugs providers can add another stress to patients looking to treat their addiction. “What we do here, we are very low barrier,” Chris Abert said, gesturing around the Indiana Recovery Alliance office. Abert, co-founder of the IRA, aims to reduce the health risks associated with illegal drug use, whether that means providing clean needles or referrals to treatment. 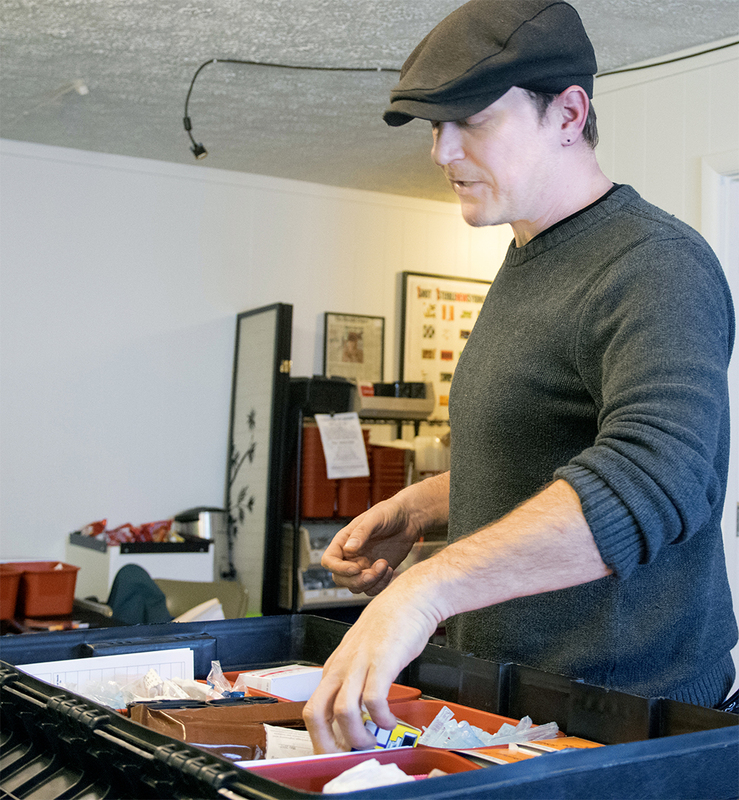 Chris Abert, director of the Indiana Recovery Alliance, shows supplies such as clean needles he uses to reduce the medical risks associated with illegal drug use. The IRA’s silver outreach van is parked outside when he isn’t driving around delivering blankets, food and other supplies. Abert is also trained to teach others to use naloxone, a medication that can reverse an opioid overdose. Any MAT is high barrier, Abert said. Access and cost issues prevent many addicts from even considering MAT. The U.S. Department of Health and Human Services lists 289 physicians who have the required waiver to prescribe Suboxone in Indiana. Five physicians on that list are Bloomington-based. Waitlists are common. The number prescribing the drug on a regular basis could be even lower, Andraka-Christou, the Ph.D. student analyzing the underuse of MAT, said. Doctors are required to register with the Substance Abuse and Mental Health Service Administration to prescribe Suboxone. They are limited to treating a maximum of 30 patients the first year, but then can reapply to increase this to 100 people the next. Suboxone can be an extraordinarily useful medication, Kleber said. But like other medications, it’s not a miracle drug. The standards of medicine-assisted treatment require counseling as well. But psychiatrists are hesitant, Gunawardane says. With training and a waiver, a doctor can prescribe Suboxone to 30 patients the first year, then 100 after. In reality, it wouldn’t drastically change a psychiatrist’s patient population because at least 30 percent of patients in their office have addiction issues, Gunawardane said. Last week at The National Rx Drug Abuse & Heroin Summit, the Obama administration proposed increasing the patient limit for qualified physicians to 200 patients in hopes it would increase access. Gunawardane is allowed to prescribe to 100 patients, but she said she doesn’t want to. It wouldn’t allow her to give the individual attention to each patient, which she can with the 43 she currently prescribes Suboxone. At Centerstone, Branam keeps a list of the 15 approved outside providers they will also work with. But the list itself illustrates one of opponent’s greatest concerns about Suboxone. One of the doctors on the list, Dr. Larry Ley of Noblesville, Indiana, was arrested on felony drug charges two years ago. Prosecutors claim Ley wrote more than 28,000 prescriptions for Suboxone from 2011 to 2013 and pocketed around $240,000. He also treated approximately 3,675 patients during that time, court documents allege, well over the 100 patient legal limit. Carol has spent more than $250,000 trying to get her son help for his prescription pill addiction. The IDS agreed to not include her last name because of her son’s association with illegal drug use. He tried a hospital in Indianapolis and treatment centers in Indiana and Tennessee. Once, he stayed clean for two years. He relapsed when a pain clinic put him on pain pills for back problems. Other times, he stayed clean for a few months after treatment. Sometimes, just for days. When her son was on Suboxone he hated it, Carol said. The doctor would change his dosage on a whim. He was required to attend 30 minutes of group therapy and 15 minutes of individual therapy with the doctor once a month. It felt like a minimum, Carol said. He did like the peace of mind that came with injections of Vivitrol, which prevented him from getting high if he tried to use again. But for $1,000 a month, he decided to stop in February after just two injections. Medicine and counseling may be the standard of care, but that’s just a slogan to her. “The ideal standard of care is a lot different than reality,” Carol said. This month, Centerstone began a group of medicine-assisted treatment only patients. In other group therapy, stigma discourages them from talking comfortably about being on medicine, Branam said. With increased awareness about the different options, he hopes that attitude will change. Dr. G discusses the stigma of addiction and why MAT is beneficial. Tom has been taking Suboxone for eight months now. He takes three strips a day — before breakfast, after lunch, before bed. He’s moved in with his ailing dad to take care of him and is rebuilding a relationship with his stepdaughter. The doctors and researchers the IDS spoke with predicted the number of people on MAT will continue growing.